• Showcase the WCE marketing and supply-chain solutions for insurance. 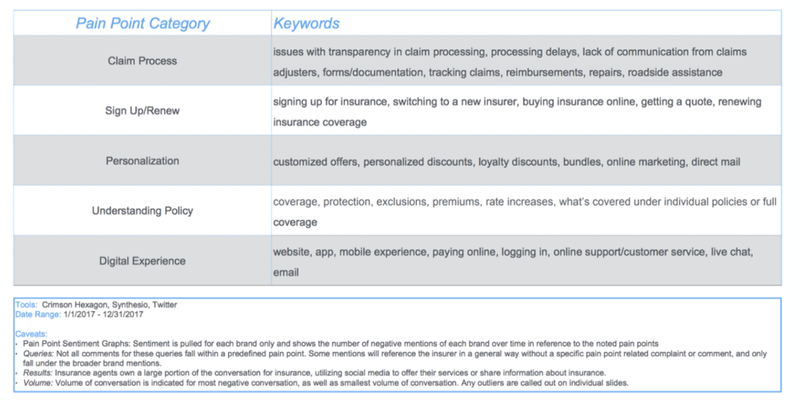 • Highlight IBM’s differentiator in the insurance category for customer engagement. • Progress users to marketplace solution pages to find out more, or contact IBM for inquiries/pricing – bringing them closer to sales. 1. More visits to marketplace solutions pages + contact IBM expert. 2. Higher in-page engagement (dwell-time & return visits). Delivering better customer experiences and engagements. Grow or defend the against digital disruptors and new cross-industry competitors. Achieving results at faster speeds than ever before. Our target audience is CMO, CIO and LOB professionals. Customers think in pain points, not products (Figure 2). IBM WCE offers them more than just Watson Marketing and Supply-chain products. If we package products by pain points they solve, visits to marketplace solutions pages will increase. If we highlight proof (in terms of real client cases, real business results, IBM accolades within insurance etc.) to emphasize experience and credibility, page engagement will improve. If we emphasize AI and Watson as an advantage, page engagement will improve and visits to marketplace solutions pages will increase. If we add more engaging images, page engagement will improve. We know these hypotheses are true when we see more visits to marketplace solutions pages + contact IBM expert and higher in-page engagement (dwell-time & return visits). This information can be accessed through IBM’s website analytics. After 4 rounds of creative development with the client, we arrived at the following design. With creative finished, the page is currently in development and awaiting user testing.